TRIUMPH TR5, TR250 ; YEARS 1967-1968. TRIUMPH TR6 ; YEARS 1969-1976. The kits include a bearing grease satchet and new front split pin. The kits areNEW and for reference have the Part No.GHK1021. TRIUMPH SPITFIRE MkI, II, III, IV & 1500 ; YEARS 1962-1980. NOTE : The price shown is for 2 kits which will complete both front wheels. These kits are suppliedNEW and boxed. For reference, the Part No. 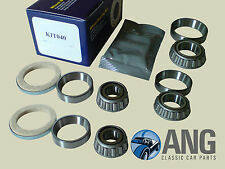 Anti Knock Off Wheel Bearing Spacer Kit for Triumph TR2, TR3, TR3A, TR4, TR4A, TR250, TR5, TR6. This stiffens the stub axle and reduces the flex which causes pad "knock off". Fits between the inner and outer front wheel bearings and allows the outer castleated nut to be torqued up tight. TRIUMPH VITESSE 6/1600 & 2 LITRE MkI ; YEARS 1962-1968. TRIUMPH GT6 MkI ; YEARS 1966-1968. TRIUMPH GT6 MkIII (NON-ROTOFLEX FROM KE/KF20000 ONWARDS) ; YEARS JAN.1973-DEC.1973. TRIUMPH SPITFIRE MkI, II, III, IV & 1500 ; YEARS 1962-1980. OE Number was: 102987. 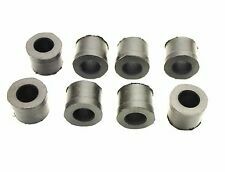 A car set of 8 top quality rear shock absorber bushes. The front trunnion bushes on the many small chassis Triumph cars were a notorious design flaw resulting in premature wear and ultimate MOT failure. If the front trunnions on your car have not been replaced recently or if the handling feels suspect then the chances are that the front bushes are worn. The rear trunnion bushes on the many small chassis Triumph cars were a notorious design flaw resulting in premature wear and ultimate MOT failure. If the rear trunnions on your car have not been replaced recently or if the handling feels suspect then the chances are that the rear bushes are worn. TRIUMPH VITESSE 6/1600 & 2 LITRE ; YEARS 1962-1971. TRIUMPH GT6 MkI, II & III ; YEARS 1966-1973. TRIUMPH DOLOMITE 1300, 1500HL, 1850, 1850HL & SPRINT ; YEARS 1972-1980. TRIUMPH TOLEDO ; YEARS 1970-1976. TRIUMPH VITESSE 6/1600 & 2 LITRE (SALOON & CONVERTIBLE) ; YEARS 1962-1971. TRIUMPH GT6 MkI, II & III ; YEARS 1966-1973. TRIUMPH SPITFIRE MkI, II, III, IV & 1500 ; YEARS 1962-1980. The price stated is forFOUR (4) BUSHES that will be suitable for either the upper or lower wishbone arms on the front suspension. Anti roll bar fitting kit for the Triumph TR6 fitted with a standard size anti roll bar. 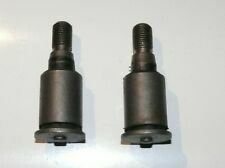 2 x Anti roll bar rubber bushes. 2 x Anti roll bar brackets. Floflex Polyurethane manufacture high performance :-. Floflex Polyurathane Bushes are designed for all conditions and uses. Triumph TR6 Front Chassis/Suspension. Bushes in Polyurethane. Suspension bushes are manufactured to a hardness of approx 80 shore A. Set of 4 quality front suspension coil spring insulating rubbers for the Triumph TR2 to TR6 range. 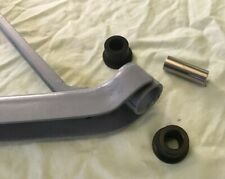 Front suspension rebuild kit for the Triumph GT6. 2 x Anti roll bar mounting bushes (standard bar). 1 x Left hand front trunnion. 1 x Right hand front trunnion. Kit comprises of the following. Triumph GT6. Bushes in Polyurethane. Suspension bushes are manufactured to a hardness of approx 80 shore A. Flo-Flex Poly Bushes. Floflex Polyurathane Bushes are designed for all conditions and uses. TRIUMPH VITESSE 6/1600 & 2 LITRE ; YEARS 1962-1971 (NON-ROTOFLEX ONLY). TRIUMPH GT6 MkI ; YEARS 1966-1968 (NON-ROTOFLEX). TRIUMPH GT6 MkIII (LATE) ; YEARS JAN. 1973-DEC.1973 (NON-ROTOFLEX ONLY). TRIUMPH SPITFIRE MkI, II, III, IV & 1500 ; YEARS 1962-1980. Triumph GT6. Bushes in Polyurethane. Front Anti Roll Bar Bushes. Link Bushes. Suspension bushes are manufactured to a hardness of approx 80 shore A. Flo-Flex Poly Bushes. Floflex Polyurathane Bushes are designed for all conditions and uses. This kit is suppliedNEW and for reference has the Part No.118599 & 102987. TRIUMPH VITESSE 6/1600 & 2 LITRE MkI ; YEARS 1962-1968. TRIUMPH GT6 MkI ; YEARS 1966-1968. TRIUMPH GT6 MkIII (NON-ROTOFLEX FROM KE/KF20000 ONWARDS) ; YEARS JAN.1973-DEC.1973. TRIUMPH TR5, TR250 ; YEARS 1967-1968. TRIUMPH TR4A ; YEARS 1965-1967. TRIUMPH TR6 ; YEARS 1969-1976. 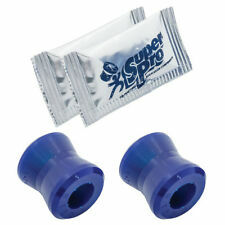 NOTE : The price shown is for 2 kits which will renew the hub bearings to both rear wheels. These kits are suppliedNEW and for reference has the Part No.GHK1015. Triumph TR6 Rear Chassis/Suspension. (Poly) Polyurethane Bushes. Suspension bushes are manufactured to a hardness of approx 80 shore A. Flo-Flex Poly Bushes. Floflex Polyurathane Bushes are designed for all conditions and uses. TRIUMPH 2000 MkI & MkII (SALOON & ESTATE) ; YEARS 1963-1977. TRIUMPH 2500TC MkII (SALOON & ESTATE) ; YEARS 1974-1977. TRIUMPH 2500S MkII (SALOON & ESTATE) ; YEARS 1975-1977. TRIUMPH 2.5PI MkI & MkII ; YEARS 1968-1975. TRIUMPH GT6 MkI, II & III ; YEARS 1966-1973. TRIUMPH DOLOMITE 1300, 1500HL, 1850, 1850HL & SPRINT ; YEARS 1972-1981. Each kit includes a bearing grease satchet and new front split pin. NOTE : The price shown is for 2 kits which will renew the hub bearings to both front wheels. ROVER SD1 2000, 2300, 2600 ; YEARS 1976-1986. ROVER SD1 3500 ; YEARS 1976-1982. ROVER SD1 ; 3500 VANDEN PLAS ; 1980-1986. ROVER SD1 VITESSE ; YEARS 1982-1986. ROVER SD1 VITESSE TP ; YEARS 1985-1986. For reference, the Part No. is 106845. TRIUMPH TR2, TR3, TR3A ; YEARS 1953-1961. TRIUMPH TR4 ; YEARS 1961-1965. The price shown is for a set of 4 bushes which will be sufficient for one car. TRIUMPH TR7 & TR8 ; YEARS 1975-1981. TRIUMPH DOLOMITE 1300, 1500HL, 1850, 1850HL & SPRINT ; YEARS 1972-1980. TRIUMPH TR7 2.0 (FHC & CONVERTIBLE) ; YEARS 1975-1981. 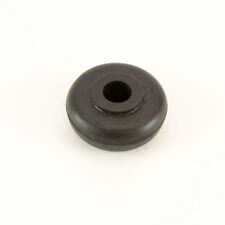 Replace the front wheel bearings on your TR7 with these high quality parts. NOTE : The price shown is for 2 kits which will renew the hub bearings to both front wheels. 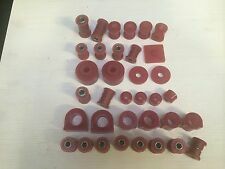 Triumph TR Rubber Upper Shock Absorber Bush - Single Used on all TR models, TR2 - TR8. Top Hat OD 18mm. LAND ROVER. 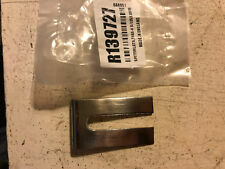 This kit of parts is suppliedNEW and for reference, has the Part No.139835K. 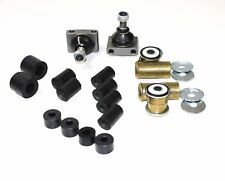 The kit includes various trunnion seals, O-rings, spacers plus a UNF zinc plated bolt, washers, split pin and the like that will enable you to replace the typical wearing parts on the lower front suspension trunnion of your TR. TRIUMPH TR5, TR250 ; YEARS 1967-1968. TRIUMPH TR6 ; YEARS 1969-1976. 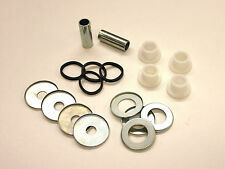 This kit includes the all important bearing grease satchet and new front split pin. 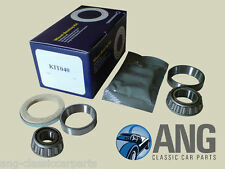 NOTE : This kit will renew the hub bearings toone side only. TRIUMPH VITESSE 6/1600 & 2 LITRE (SALOON & CONVERTIBLE) ; YEARS 1962-1971. TRIUMPH TOLEDO 1300, 1500 ; YEARS 1970-1976. The kits include a bearing grease satchet and new front split pin. NOTE : The price shown is for 2 kits which will renew the hub bearings to both front wheels. TRIUMPH VITESSE 6/1600 & 2 LITRE ; YEARS 1962-1971. TRIUMPH GT6 MkI, II & III ; YEARS 1966-1973. TRIUMPH SPITFIRE MkI, II, III, IV & 1500 ; YEARS 1962-1980. TRIUMPH HERALD 948, 1200, 1250 & 13/60 ; YEARS 1959-1971. TRIUMPH TR2, TR3, TR3A, TR3B y TR4 suspensión delantera reforzadas Bush Kit GAC6068U. 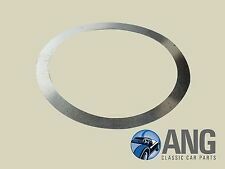 Uprated front suspension bush kit for Triumph TR2, TR3, TR3A, TR3B and TR4. Specially assembled in house by TR Enterprises, this kit contains all of the wearing bushes required to correctly re-build the front suspension of your TR2-4. 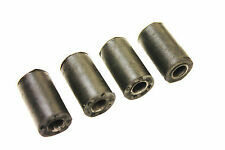 A set of quality front shock absorber bushes for the Triumph TR2 to TR6 range. OE Numbers were: 21A860 X 4 (Top) & 119450 X 2 (Bottom).